This book brings the neurosciences to operational and clinical aviation medicine. It is concerned with the physiology and pathology of circadian rhythmicity, orientation, hypotension and hypoxia, and with disorders of the central nervous system relevant to the practice of aviation medicine. The chapters on circadian rhythmicity and orientation deal with the impaired alertness and sleep disturbance associated with desynchrony and with the effects of linear and angular accelerations on spatial awareness. Hypotension and hypoxia cover cerebral function during increased gravitational stress, clinical aspects of exposure to acute hypoxia, the mild hypoxia of the cabin of transport aircraft, adaptation and acclimatization to altitude and decompression at extreme altitudes and in space. Disorders of particular significance to the practice of aviation medicine such as excessive daytime sleepiness, epilepsy, syncope, hypoglycaemia, headache and traumatic brain injury are covered, while neuro-ophthalmology, the vestibular system and hearing also receive detailed attention. The potentially adverse effects of the aviation environment and of disorders of the nervous system are brought together, and the text covers the neurological examination as it relates to aircrew and explores current management and therapeutics. 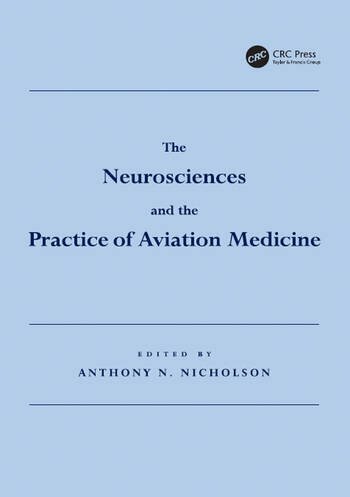 The Neurosciences and the Practice of Aviation Medicine is an essential work for those involved in the practice of aviation medicine where familiarity with the effects of the aviation environment on the nervous system and understanding the pathophysiology of relevant clinical disorders are of prime concern. The authors from leading centres of excellence are physiologists concerned with the aviation environment and physicians involved in the day-to-day practice of medicine. They bring to this authoritative text wide experience and expertise in both the experimental and clinical neurosciences. Contents: Foreword, Lord Owen; Preface; Wakefulness, awareness and consciousness, Anthony N. Nicholson; Circadian system and diurnal activity, Russell G. Foster; Aircrew and alertness, Anthony N. Nicholson and Michael B. Spencer; Spatial orientation and disorientation, J.R. Rollin Stott; Cerebral circulation and gravitational stress, Anthony N. Nicholson; Oxygen delivery and acute hypoxia: psychological and clinical considerations, Jane Ward; Hypobaric hypoxia: adaptation and acclimatization, John H. Coote and James S. Milledge; Profound hypoxia: extreme altitude and space, Anthony N. Nicholson; The neurological examination: aeromedical considerations, Michael D. O'Brien; Investigation of sleep and wakefulness in aircrew, Anthony N. Nicholson; Excessive daytime sleepiness: clinical considerations, Thomas C. Britton, Andrew R.C. Cummin and Anthony N. Nicholson; The diagnosis of epilepsy, Matthew C. Walker; Syncope: physiology, pathophysiology and aeromedical implications, David A. Low and Christopher J. Mathias; Hypoglycaemia and hypoglycaemia awareness, Simon R. Heller; Headache, Thomas C. Britton; Traumatic brain injury and aeromedical licensing, Garth S. Cruikshank; Neuro-opthalmology, Gordon T. Plant; Vestibular and related oculomotor disorders, Nicholas J. Cutfield and Adolfo M. Bronstein; Disorders of hearing, Linda M. Luxon and Ronald Hinchcliffe; Appendices; Index. Anthony Nicholson graduated in medicine from the University of Birmingham. He is a Fellow of the Royal Colleges of Physicians of Edinburgh and London and of the Royal College of Pathologists, a Fellow of the Royal Aeronautical Society, an Academician of the International Academy of Aviation and Space Medicine and one time Vice-President of the Aerospace Medical Association. Air Commodore Nicholson was formerly the Commandant and Director of Research of the Royal Air Force Institute of Aviation Medicine, Farnborough, and, lately, the Visiting Professor (Aviation Medicine) at the Centre for Human and Aerospace Physiological Sciences, School of Biomedical Sciences, King's College London.